has knowingly sponsored, endorsed, and forever immortalized these butchers into history. ANDREW AGUSTUS ALLEN, was a Sgt. 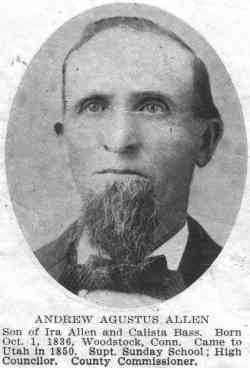 in the Iron County Militia and a MORMON SHOOTER AND CLUBBER; (son of Ira Allen and Calista Bass) Born Oct 1, 1836, Woodstock, Windham county, Conn.
Married Sarah Ann Cartwright, June 14, 1857 Cedar City, Utah (daughter of Thomas Cartwright and Sarah Yates), who was born Jan 12, 1840, in Lancashire, Eng Their children Andrew Augustus b Aug 25, 1858, m Lovisa Hammond April 4, 1889, Calista Ann b April 23, 1861, d May 19, 1878, Thomas Ira b Oct 1, 1863, m Minnie Hammond Jan 6, 1879, George Q b Feb 16, 1866, d 1872, Sarah Ellen b May 30, 1868, m Ezra Peterson Dec 22, 1887. Married Rebecca Christine Nielsen April 14, 1887, Logan, Utah (daughter of Hans Enoch Nielsen, pioneer Sept 29, 1854, James Brown company, and Nancy Margaret Osborn, pioneer 1852) She was born Jan 24, 1864, Hyrum, Utah Their children Lauretta Jane b June 27 1888, m Reuben Hansen June 1, 1911, Margaret Vilate b Sept 11, 1890, Glen Nielsen b July 15, 1892, Esther b March 18, 1895, Elva Mae b Aug 25, 1898, Bessie b May 13, 1901, Hollis Verne b July 19, 1905 Family resided Hyrum, Utah. Sunday school superintendent, high councilor. Death Certificate. In 1858 BRIGHAM YOUNG received a presidential pardon for his part in the atrocities at Mountain Meadows from President Buchanan. Photographs taken from an original first edition publication of the book "Pioneers and Prominent Men of Utah." Contributed by MARK MOULTON.